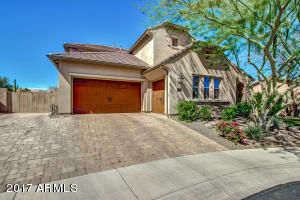 Fantastic cul-de-sac lot home in highly sought after peoria neighborhood! Great room has wall to wall windows, soaring ceilings, and exposed beams! Cozy fireplace and entertainment nook with room for storage! Stunning chef's kitchen is large enough for any crowd! Oversized island with breakfast bar and granite counters. Stainless steel appliances. Custom cabinets with stylish hardware. Master suite(downstairs) retreat has plush carpet with picture windows and a private exit to backyard. Spa bathroom with his + her vanities and roman soaking tub + walk in shower. Mother in law suite. Large loft with hardwood flooring and guest rooms upstairs. Backyard features an extended patio, mountain views and sport court.Large backyard w/ rv gate, no homes behind with green belt and mtns. Directions: Start From 67th ave & happy valley rd. From there, go North on 67th ave, turns into pyramid peak, left on sonoran mountain ranch, left on lighting right on mazatzal, left on 68th dr to end and in cul de sac.